How Does The Bridgestone B330 RX Golf Ball Perform? How does the Bridgestone Tour B330 RX golf ball perform under course conditions? There’s always some doubt what the manufacturer says in their advertisement. Will the ball live up to the hype? Will the ball perform on the course as it does under testing conditions? In this article, I will give you my honest opinion on the performance of the Bridgestone Tour B330-RX as compared to a Titleist Pro VX1 for distance, ball flight, spin, stopping distance, and feel around the green. Bridgestone Golf didn’t provide me with the golf balls to test, they did, however, send me golf balls as an award for being voted (by peers) as the top fitness #GolfChatter on Twitter. The fact that I didn’t purchase the golf balls has no influence on my opinions stated in the article. The Bridgestone website lists the balls as Tour B330RX, but I most often see the golf balls listed as Bridgestone B330RX or Bridgestone B330 RX. It’s my opinion that the Bridgestone B330 RX is a good golf ball and a less expensive alternative to the Titleist Pro V1. The B330RX will perform especially well when the golf course conditions are firm or in windy playing conditions. I did prefer the Titleist Pro V1X around the greens, but this could be because that is what I’m used to playing. Some links in this article are Amazon Affiliate links. If you purchase after clicking on the link I may receive a small commission at no additional cost to you. What Does Bridgestone Golf Say About the B330 RX? Promotional material says that the Bridgestone Tour B330 RX is made for amateur golfers with swing speeds under 105 mph. They’re composed of a soft multilayer urethane and made for added distance, claiming tour caliber distance. The core of Bridgestone B330 golf balls is called Hydro Core Technology, and I will quote what that is off of the golf ball box. Hydro Core Technology incorporates water into the core formulation process, enhancing the gradation of the core’s inner (softer) and outer (firmer) regions. The result is reduced spin for longer distances. Since it says that water is incorporated into the core, I assume that means it is not a liquid core, but rather the properties of water affect the core material reducing the spin rate. The Bridgestone website also mentions an “Amatour Core” for better compression and less sidespin for the amateur golfer. The cover is called SlipRes, and the website states it maximizes greenside spin with no loss of spin from the rough. In the video, below Bridgestone states that the cover reduces scarring and is “self-repairing” so the golf ball looks better longer. The dimple design on the Bridgestone B330 RX creates reduced drag at launch, so the ball gets up faster as well as a shallow angle of descent for more roll and distance. Below is a promotional video Bridgestone Golf has placed on YouTube to promote their B330 series golf balls. The B330 golf ball line beside the Tour B330RX includes the Tour B330RXS ball, which has added spin. This article only reviews the Bridgestone B330 RX golf ball. If any Bridgestone representative would like to add a comment about the golf ball or any of the opinions that I state within this article it would be welcome. Since golf balls perform differently depending on the weather and course conditions, as well as who is hitting them, below is some information on the tester and the course conditions. My swing speed ranges between 99 and 108 mph. The majority of my driver swings (based on Flightscope radar data) are in the 102 to 103 mph range. My handicap index is between 4 and 6. My golf clubs include a Ping I20 driver with 9.5-degrees of loft, my fairway wood is a Ping G25 4-wood, and the hybrid is an 18-degree Ping G20, G-25 irons, and Ping Glide wedges. My putter is a Taylor Made Spider Ghost Mallet. I tested the Bridgestone B330 RX during two rounds in clear weather and temperatures in the 50’s (f). The golf balls were stored inside and were warm at the start of the round. I played both rounds with the same golf ball. Course conditions were hard and firm, but not rock-hard. I compared the Bridgestone B330 Rx with a Titleist Pro V1X, which is the golf ball I usually use during competition. I didn’t have a GPS for distance, instead, I compared distance when I hit both drives well. For iron shots, I hit both balls from the distance, not from where they ended up after the drive. 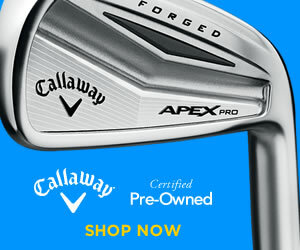 Callaway Wedge Set – Mack Daddy 2 or MD3? Off the driver, the Bridgestone B330 RX and the Titleist Pro V1 went a similar distance. When I made solid contact both balls were within 5-yards of each other. Sometimes the B330RX was ahead of the ProV1 and other times the ProV1 went further. The B330RX had a lower ball flight, and the flight pattern looked like a uniform arc. Much different than the ProV1 that started off lower but had a higher apex. The B330RX appeared to roll farther than the ProV1, which fell from a higher apex and may have had more carry distance. The ground was too hard to see where the ball landed compared to where it ended up. The sound off the driver was different, but I didn’t have a preference for either ball. Both balls compressed well, the B330 seemed to yield a little more on solid hits, but it didn’t stick to the club head. I had no preference for either one. Both the B330RX and the ProV1 didn’t curve much; I usually hit a relatively straight shot with a slight fade, and I didn’t see much difference between to the two. Based on my observations, the Bridgestone B330 RX would be a good ball to use in windy conditions when the course is dry and firm. The ProV1 appeared to have more carry distance based on the ball flight, but the overall distance was very similar. The Bridgestone B330 RX outperformed the ProV1 in this category by a long shot. Unlike my driver, with fairway woods and hybrids I hit draws. The B330RX out distances the ProV1 consistently by 10-yards with the 4-wood. The B330RX ran much farther than the Pro V1. However, at the course I play I need to hit a hybrid with a high fade to two pin locations due to hazards on the right and more room to the left if I miss. The ProV1 would go much higher, fade easier, and land much softer than the B330RX off the hybrid. With the Bridgestone, I could hit my 4-iron with a low fade and it runs a similar distance as the hybrid with the B330. If I needed to carry a hybrid over a hazard or bunker, or if the front of the green was wet reducing roll I’m not sure I would use the B330RX as the ProV1 has more carry. The B330RX felt good off the long irons. The ball flight was lower but still held the green. The ball flight was very similar to the driver arc, the first couple of long irons I hit I didn’t think the ball would hold on the firm green, but they did. Carry distance was similar to the ProV1. That again surprised me due to the lower ball flight. The ProV1 would land softer no doubt, but the B330 RX took a hop and sat down quickly. I’m not sure why the B330 acts so differently off my hybrid than the irons but I couldn’t get the ball to spin with the hybrid. Again, the B330RX would be ideal in windy conditions due to the lower ball flight. If you hit a lot of fairway woods and need distance on par 5’s or long par 4’s, I would go with the Bridgestone B330RX as it rolled out much further off the 4-wood. The Bridgestone B330 RX had another surprise for me, expecting the same low trajectory that I got off the long irons I was surprised when the B330RX jumped high off my 8-iron. The early ball flight of the B330RX was higher than the ProV1. In fact, I didn’t believe it the first time. It was like a different ball off the short irons. Here is where I expected the ProV1 to shine. In the end, both balls performed the same. Let me show you in the photos below. The shot was a 62-yards and I hit a half to three-quarter 56-degree wedge. The ball below the hole is the Prov V1, and the ball above the hole (right-side) is the B330RX. In the photos below you will see that both balls bit the firm green well and stopped about the same distance after hitting the green. The putter handle marks the location of the ball mark. You can use the grip also to estimate the stopping distance. The Bridgestone B330 RX is on the left (or the first image if you are on a mobile device) and theProV1 is on the right or the second photo. The ProV1 stopped a little quicker than the Bridgestone B330RX, but it also landed on more of an upslope. As you can see the greens are still dormant and firm but B330RX has as much bite as the Pro V did. As with the 8-iron, the B330RX jumped high off the wedge face. I see no advantage to either ball with the short irons and wedges. I’m not sure if in windy conditions the higher early ball flight of the B330RX would have any effect or not. If it did, I think taking one more club wouldn’t matter as the ball will spin and bite on the green. If I had to rate the balls, the short-irons would be a tie. The Bridgestone B330 RX felt a little firmer than the Pro V1 when chipping and putting. I didn’t have any performance issues with the B330RX; the sound was crisp and louder is all, I’m used to a more subtle sound. Even though the sound was crisp, the B330RX didn’t jump off the wedge or putter face, it was controllable. On longer chips, the B330RX bit well on the second bounce and had a lot of spin off the 60-degree on flop shots. I preferred the Pro V1 on chips and putts, but that is probably only because I’m used to playing that brand of golf ball. The B330RX didn’t have any performance issues around the green. How Did The Bridgestone B330 RX Hold Up? The Bridgestone B330 RX held up pretty well. Below are three photographs that show a little damage to the ball. The first photo is the B330RX after 18 holes. You can see some damage to the paint around the dimples where the ball compressed and chipped the paint. The other two photos are of the same ball after 45 holes. Again some minor chipping and a place where it hit a tree pretty hard. I will still use this golf ball; I’m not sure what more you could ask from a golf ball. The durability is very good in my opinion. The best part is that you can purchase the Bridgestone B330 RX for almost $21 less than the Titleist Pro V1’s. That is a significant saving on a dozen golf balls. Based on the playing both balls for 36 holes I will be stocking my bag with a sleeve of Bridgestone B330 RX golf balls. I have a tendency to switch up golf balls once in a while, and I will be using the B330 especially on windy days when the course is dry and firm. The B330RX has a lower ball flight and more roll off the driver and fairway woods, a penetrating flight with the long irons, but gets more height than the Titleist off the short irons. Although I preferred the Titleist around the green, it was mostly due to the sound and not the performance of the golf ball. The cover on the golf ball holds up well, and you can get a lot of play with one ball if you can keep it out of the woods or water. The price is another factor, at a saving’s of $21 that is a lot of money. At the time of publishing this article, the B330RX is $34.99 from Amazon and around $39.99 in the major retail stores. For all of these reasons, the Bridgestone B330 RX is a quality golf ball in my opinion. Try out a sleeve of Bridgestone B330 RX and see what you think. If you have any comments or a differing opinion, please leave me a comment below. I mentioned #Golfchat in the introduction. #Golfchat is a Twitter chat held on Tuesday evenings at 8 pm EST. I’m not sure how many of us are in the chat but there have to be well over 100 people. #Golfchat is an hour long with a new golf related question asked every 10-minutes followed by an open discussion on the question. It is a very enjoyable hour, some of the questions get people really riled up, there is a lot of humor, and talking about golf. You can learn more at Golfchat.org. If you have a Twitter account you should check it out, use the hashtag #golfchat.